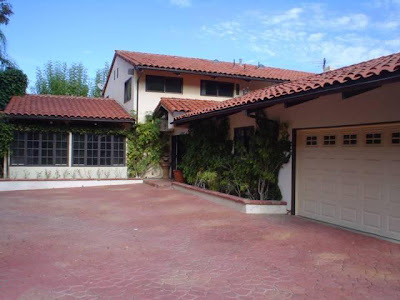 A couple of weeks ago Your Mama discussed the secluded Studio City, CA residence of young actress Kristen Bell (House of Lies, Gossip Girl, Forgetting Sarah Marshall, Veronica Mars) falling into the ugly maw of foreclosure. Yesterday Miss Bell's former pad popped up on the open market as a bank owned property with an asking price of $1,995,000. A couple of quick clickety-clacks of the well-worn beads on Your Mama's bejeweled abacus shows that's a significant $1,105,000 less than the $3,100,000 Miss Bell paid for the 2.6 acre spread in November 2006. Current listing information shows the privately situated and somewhat bedraggled two-story house, built in 1969, measures 3,867 square feet and includes 3 bedrooms and 3 bathrooms plus a possibly unpermitted wing with an additional 2 bedrooms, study, 2.5 bathrooms, and a laundry closet. It's pretty obvious...she was underwater with this one and she swam away. "Pay yer bills or get a better money manager sweetie"! Pretty pathetic that this wealthy actress who has millions decided to dump this house and screw the tax payer and not pay her debts. She can take the credit hit because she has millions in cash. Some will claim its just her financial advisor who told her to do it. Sure. It it's still her decision. Kristen Bell is active in politics on twitter and an Obama supporter. She tells others how to spend their money to be better people and claims we should pay more taxes. And then she turns around and does this. She saves a bunch of her money which she doesn't need as a millionaire and hurts other less well off people in the housing market. She is a hypocrite and not the person she tries to portray publictly. As we say in car circles, "that will buff right out". This chapter seems to be over and Kristen can move on. ouch....no matter who you are, that drop in price is a kick in the pants. someone will step up and buy it. probably bulldoze it. I love how people like you try to tie politics to this. She is an Obama supporter, so what? I guess no Republicans ever walk away from their houses. How is the taxpayer being screwed again? I did not realize that we held the mortgage on Kristen Bell's home. If anything she is using a tax strategy that Republicans probably invented. And if you want to talk about the taxpayer being screwed over, how about Mitt Romney being able to squirrel away over $100 million to his kids in offshore banks and not pay a dime of tax on that? This isnt about democrats or republicans. I hate both politicians equal. What is your argument that republicans are worse so what she did is OK? Pretty stupid. I was using her specifically as an example. IF she was a republican who claimed to be morally better than others and then did something to be a hypocrite I would call her out on that. But that isnt the case. She is a vocal democrat who uses her celebrity to speak out. A democrat who claims she is for the common person not the rich that only republicans care about. Yet in her personal life she is wealthy and decided to make a decision to hurt others who are not well off. If you dont understand how economics work that is fine. But people like her who walk away from their loan and foreclose their house because its better for them to save money hurt other people. Those people are part of the problem of our bad housing market. People making bad decisions buying house they cannot afford and then walking away from their obligation. SHE IS HURTING other people who are not rich like her. She is selfish and made a decision to save some cash at the expense of others. Love you, Mama, and wish I knew who you are! Are you aged but elegant and beautifully preserved? Young and sassy? Of an age to be my long-lost daughter? Anyhow, my dear soybean, I enjoy your blog immensely. Thank you for all your efforts. That place will probably be price-chopped close to another million bux before it sells. I'm good with that. As for Ms.Bells' "strategic default": Hey...everybody's doing it. Just a very general FYI, Mama is a man.